We’ve just received the new “Atmosphere” speakers from hORNS in Poland. You can read more on their website, at horns.pl. This two-way speaker has an additional, rear firing woofer than can be switched in and out as room placement demands, no doubt, part of the reasoning behind the name. With a rated sensitivity of 84db/1-watt, it will be interesting how they match up with the amplifiers we have on hand. Initial MSRP is $5,000/pair and custom finishes are available at no extra charge. 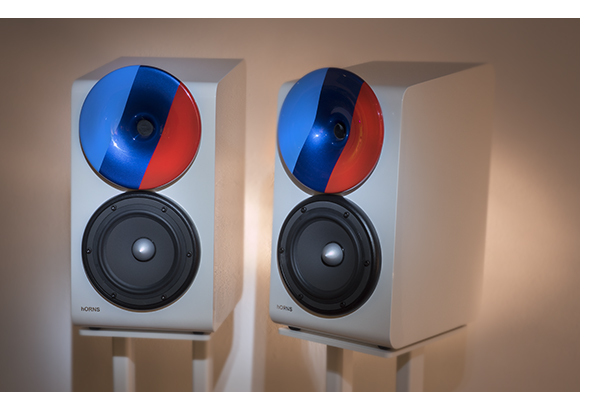 Our review pair is beautifully finished in BMW “M” colors with white stands, which are included, also at no extra charge. Stay tuned, we will have a full review shortly and they will be featured in issue 92 – our “small speaker” issue.